Neptune, astrological ruler of the political Left, is the consummate master of hiding his own history, even from his own faithful. The fact that the word "Progressive" can be uttered in the same breath as "civil rights", that Franklin Delano Roosevelt can be credited with helping the Jews escape Nazi persecution (he denied them entry to the US), and that historically-clueless hipsters can wear Che Guevara T-shirts without being charged with hate crimes: these all attest that when it comes to self-deception, the Left is unparalleled. Indeed, the very existence of the Left as we know it today relies on the uniquely human ability to invent and believe in an alternate reality, completely divorced from fact. (The Right has it coming, too... I'll pick on them if they ever come to power again). It is this tendency towards deception, among others, which has made an astrological mapping of the ethical/political spectrum challenging. Our mainstream political history hides the true nature of countless political movements and personalities. An astrologer seeking to truly apprehend the way in which planetary movements correlate with human events must first uncover an accurate history. This is much easier now in the advent of the internet than it was when academia, married to the reigning political power structure, was the sole source of historical information. In the spirit of the quest for truth, no matter how unpleasant, we examine today's astrological chart. If we believe the mainstream media, Nelson Mandela is a pure and great symbol of freedom, a man of great moral authority and ethical conviction who surrendered much in service of his fellow humankind. A minute's research on the web, something few will take the time to do, shatters this flowery image entirely. Mandela was not only a Communist but a leader of the African National Congress, a terrorist organization which has deliberately targeted civilians for killing. This symbol of freedom actually stands for anything but. Apartheid was a horror, but Mandela's ANC was even less humane than the regime it fought. 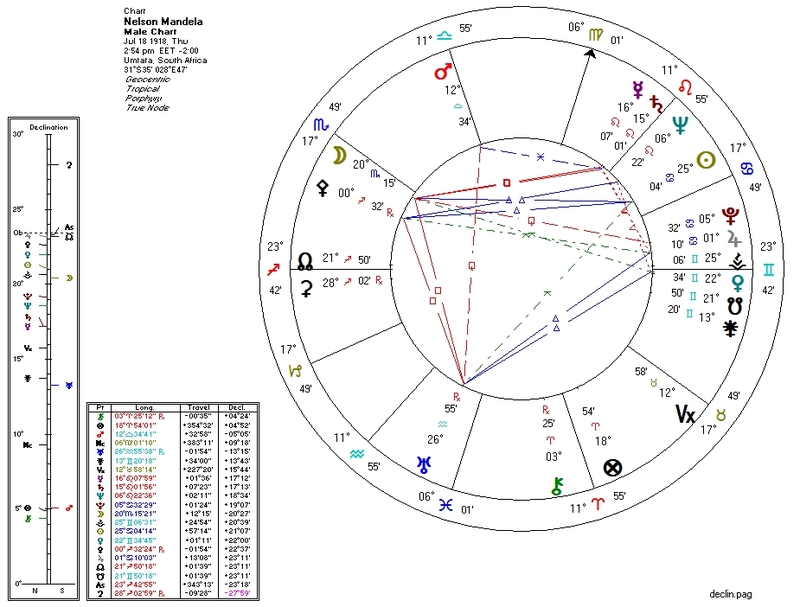 On the libertarian end, Pallas is trine the Sun on Mandela's chart. So far, so good. The "good", however, ends here. For Pallas is parallel with the life-sucking South Node, and is ruled by Jupiter which is both parallel the South Node and conjunct murderous Pluto. Extreme economic-Leftist psychology is very evident: the South Node is conjunct Venus and Second House ruler Saturn is conjunct Neptune. Putting him on the cultural Left and sealing our far-Left diagnosis is the Moon quincunx his very prominent South Node. Adding injury and death to insult, Mandela also possesses features that not only put him in the Left-Authoritarian category, but complete the Bloodbath Formula and put him in the company of most serial killers: Pluto is sesquiquadrate the Moon (ruler of the Sun) and indirectly conjunct Venus. Doing our historical homework allows us to make sense of this chart, which matches the man and not the myth. This is not the horoscope of someone who wants to liberate his fellow humans, but quite the opposite. It is the chart of a murderer. AnonymousDecember 6, 2013 at 6:27 AM The leftist pantheon just got another saint (who would save the world from the racists by being an even bigger, more ruthless racist.) Question: do humans NEED religion? ReplyDelete Promethean AntagonistDecember 7, 2013 at 2:39 AM Thanks for adding some honesty among current appraisals. Of course anyone who resists injustice is due praise, but the long list of semi-saints passed off on the public is growing old. There's even a widely held view that Trotsky was somehow a lessor demon than Stalin. He merely didn't get a full grip on the reins of power. So it is with many in the pantheon of leftist god-men and women. Accurate appraisal beats hero worship every time. Resisting oppression does not give one a free pass to support authoritarian ideology. ReplyDelete Replies astrolibertarianDecember 7, 2013 at 8:00 AM There's a good line from the recent "Hunger Games" movie sequel: "remember who the enemy is". The people in charge are always trying to make us forget, by lionizing criminals and marginalizing true heroes. Delete Reply ApolloSpeaksDecember 10, 2013 at 4:59 AM AS IF BY AN ACT OF PROVIDENCE Nelson Mandela became president of South Africa on May 10, 1994, the 129th anniversary of the end of the American Civil War; and left office 1861 days later, symbolizing the year the American Civil War began. For more on the fascinating subject click or google www.apollospeaks.com ReplyDelete astrolibertarianDecember 30, 2013 at 6:00 PM http://www.lewrockwell.com/2013/12/thomas-dilorenzo/south-african-apartheid/ An article on the Left-wing roots of apartheid -- the struggle between apartheid and those opposed to it was a Left-versus-Left conflict.